Inder Loves Folk Art: KCW Spring 2015, Part 2: Purple with Pink Flowers! KCW Spring 2015, Part 2: Purple with Pink Flowers! Okay, I know KCW is now pretty much a distant memory (that was five days ago! 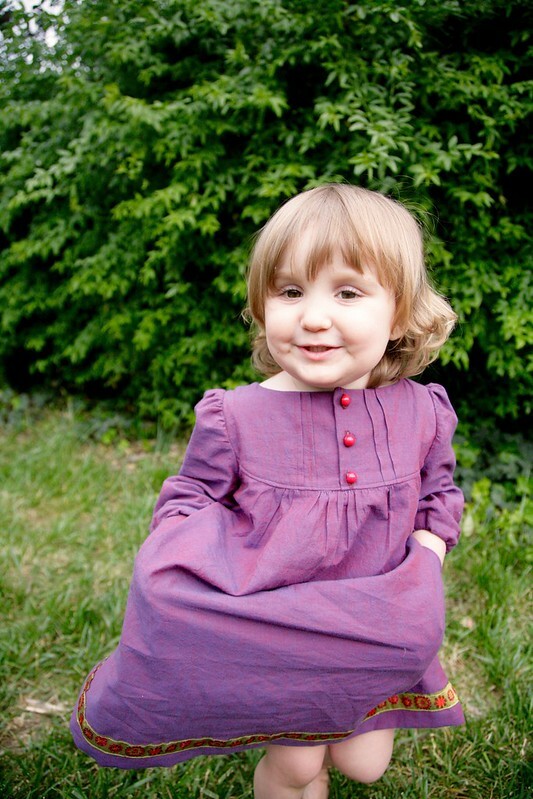 ), but I'm here with my second installment: a purple dress for little Maggie! I've had my eye on Brooklyn Pattern's Franklin Dress for a while - I love the old fashioned look of the curved yoke and pintucks. But I'm on a pattern diet, right? 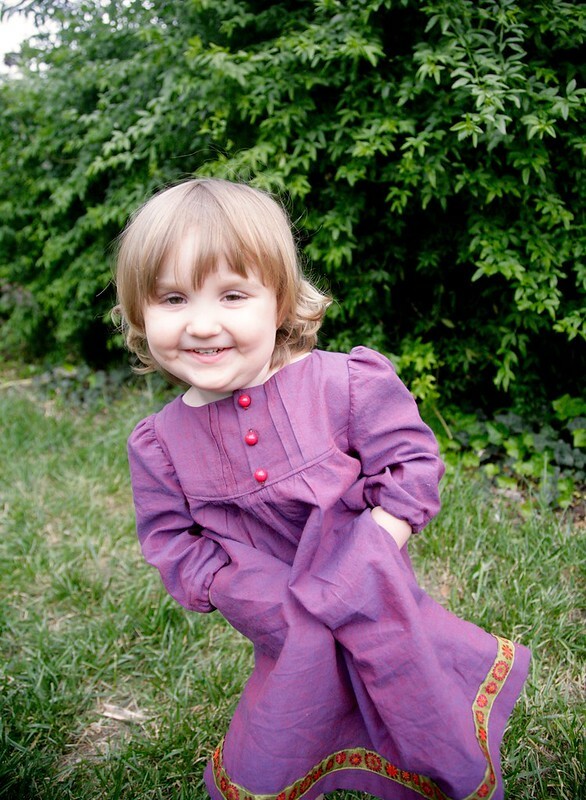 Well, when the pattern was chosen for Flip That Pattern, it briefly went on sale, and er ... I bought it. So it goes. I love this dress! This was my Maggie project for KCW, and I spent most of the middle of the week working on it for a few minutes at a time in the evenings. These days, Maggie often asks me, "What are you making, mama?" 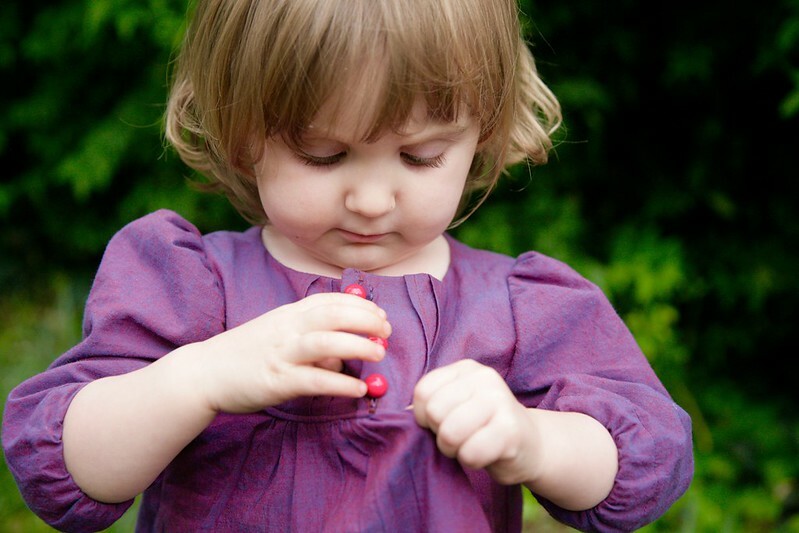 Here, I told her, "I'm making you a purple dress, but it will have pink buttons and flowers." To my delight, she seemed happy about wearing a not-entirely-pink dress. She then proceeded to ask "What are you making?" approximately ten times a day for several days, making this dress feel like a longer project than it really was: "I'm still working on your purple dress." "With pink flowers?" "Yes, with pink flowers." Rinse, repeat. And she likes it!! I'm hopeful that Maggie is slowly emerging from her pink-only phase and may be expanding her color horizons a bit? I never thought I'd be thrilled to make Maggie a purple dress (purple isn't my favorite color) but this beautiful purple shot cotton really almost glows. Photographs don't do it justice. 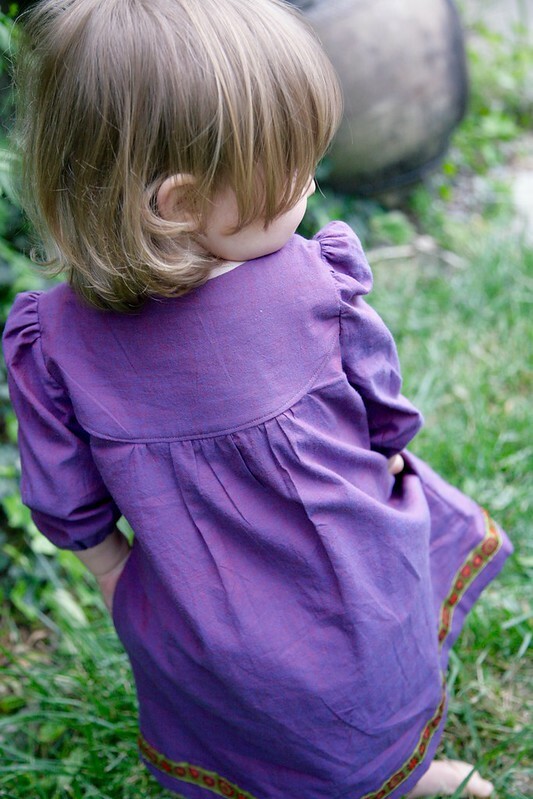 It's the perfect fabric for a breezy lightweight summer Franklin dress. The pink buttons definitely help, of course! 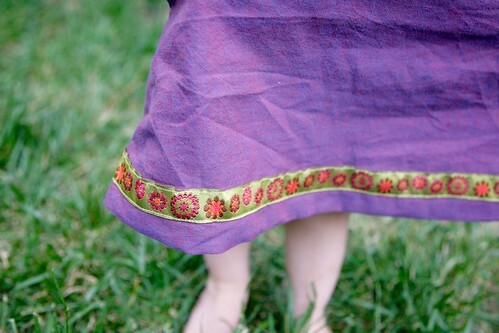 As does the trim I sewed along the bottom, which is lime green with pink flowers. I've had this ribbon in my stash for years, waiting for the right application, and when I saw Gail's Franklin Dress with ribbon along the hem, I decided to steal copy her idea for this dress. I love the way the lime green looks against the purple shot cotton. Such a rich color combination! 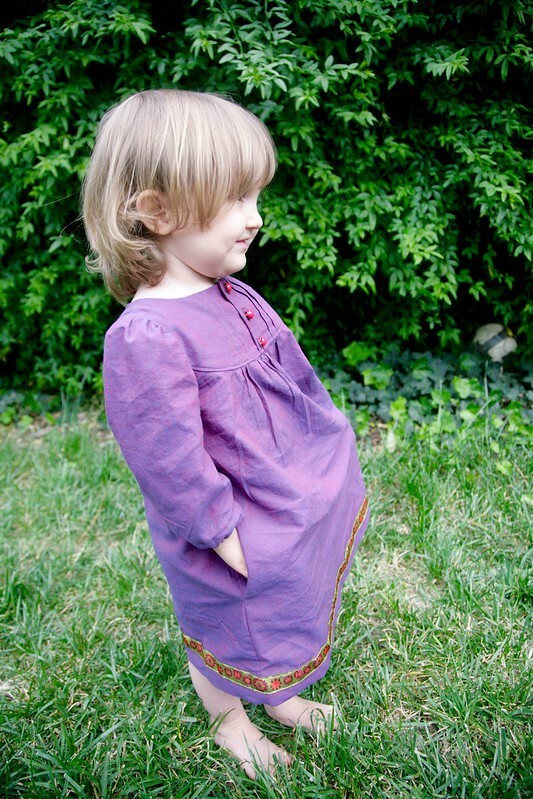 The Franklin Dress is a pretty straightforward sew. 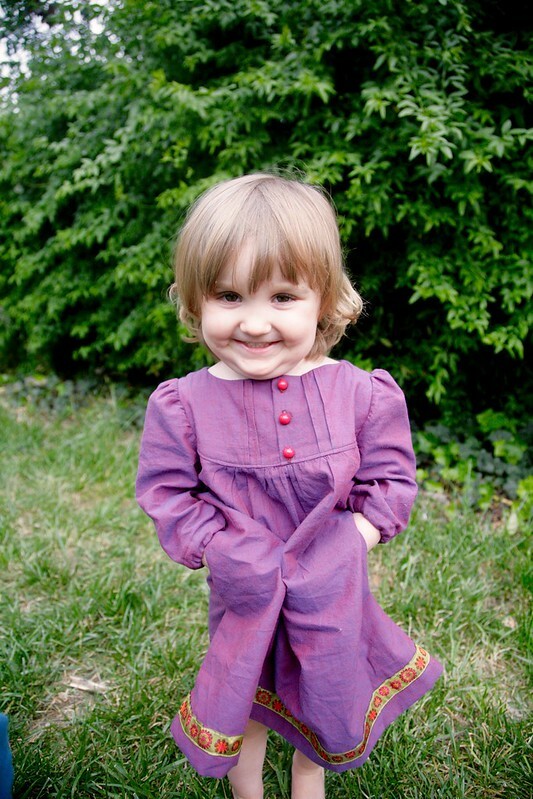 The curved yoke and puffed sleeves are really sweet and old fashioned. I like that the yoke buttons are functioning and no other closures are required, making it an easy dress to get in and out of (this goes over Maggie's head with just the top two buttons undone). Maggie likes that it has pockets! 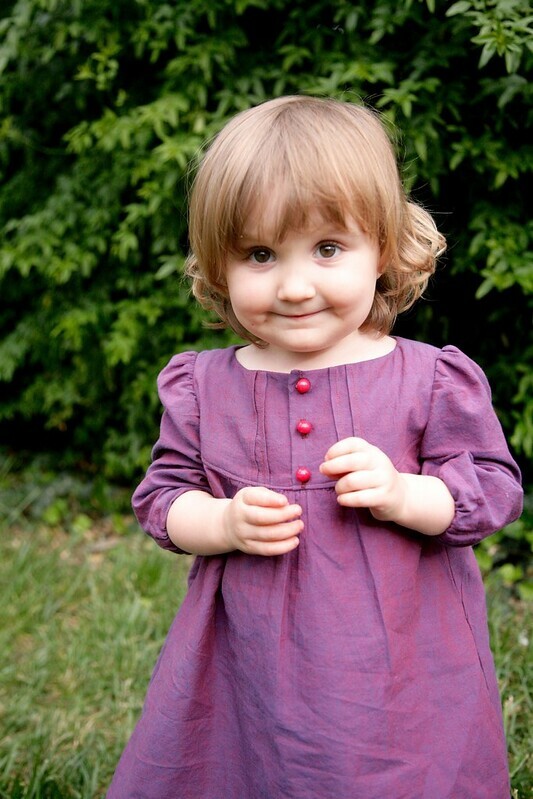 Oh Maggie, you could not be any cuter if you tried. Maggie is full of language these days, plays imaginative games with Joe all day, and already makes poop jokes! She's potty training herself right before our eyes and it's probably only a matter of weeks or maybe a couple months before she's diaper free. (So unlike Joe, who was in diapers until he was almost four!) But she's still a baby in many ways as well, coming to get her "owies" kissed, snuggling in the evenings ("mow mows" make everything better), and answering to "baby." I am not usually one to sentimentally exclaim that my children grow too fast; in general, I feel pretty good about my children growing older, and I find each new age to have its delights and benefits. But this age - 2 years and 9 months - is very sweet. I don't want to stop time, but I do wish I could hold onto these memories forever. It's upsetting how quickly they fade! For her part, I hope she'll remember how very loved she is. All in all, I'm calling this a productive KCW week! I had a lot of fun participating. Since Sunday, I've been working on a top secret birthday project for Joe, which I hope to share next week (his birthday party is Sunday). That's right, my baby bull (Taurus) is turning six (SIX!!!). Eeek! I, Inder, am signing up for Me Made May 2015 with the goal of wearing something Me-Made 5 days a week. I am sure I will repeating a lot and I will not try to wear head-to-toe Me-Mades although who knows? I'll post my photos on Instagram and maybe do some round ups on the blog too. What about you? Are you participating in Me Made May this year? The fabric is gorgeous in the pics so it must be amazing in real life. I love the dress. Might have to check out the pattern myelf! Oh my goodness. She's got dimples on her dimples!! Cutest little face. The dress looks fab, and I'm no purple fan either but truly, it's very pretty. I can wear me made for most of may, but can I get a photo every day? I doubt it. Agreed! I don't think Maggie could be any cuter with those curls at that smile and that dress! My mother in law bought this pattern to make for E and I'm excited to see her version. Such a sweet pattern. Pockets are so very important! This dress really suits her. I just want to reach through the screen and squeeze those little cheeks! Sweet, sweet dress and love the shot cotton. Oh man. This is seriously cute. I wasn't particularly drawn to this pattern, but you really made it shine. I totally lucked out that both Tia and Iris potty trained themselves at 2 . Best thing ever. Jude was 3 + 4 mo and Indigo was 3 + 6 months. I felt like I was changing grown adults. Indi would build a whole 'poop closet' as we called it out of pillows so she could have privacy when going in her diaper. When you need privacy, you need to put it in the toilet. So SO glad my other two were early trainers. And, yeah, M has a great vocab being she is already asking "What are you making?" That's quite advanced fro 2. My girls always ask that too! <3 This age really is great. But what's super awesome is that Indigo and Jude's ages are so awesome, too. They are all so great, but in their own ways. Just like you said. And yes, I hear you on memories. I think that's why I love photography so much. She really is the sweetest child. Those doe eyes and curls are beautiful! I always want to take part in MMM but when I assess my current wardrobe, there just isn't enough to keep going for a month. Maybe next year. I have been purposely buying fabrics for me and not the girls. Delicious little Maggie! I love the dress too! She is such a cute little munchkin. I didn't realize that she's pretty much the same age as my Andrew. He doesn't show much interest in what I'm sewing, but he sure loves to sit on my lap and try to get involved with all of the buttons on my machine. This dress is so cute-- the ribbon trim is such a sweet detail.